Water: The Gift of Life – Enjoy it! Water is essential to all life on Earth. Our bodies contain about 60% water for adults and 75% water in infants. In essence, we “are” mostly water. The quality of our water affects our quality of life. It affects our health, taste, skin, and overall enjoyment. Since the moment I arrived in Florida in 1993, the first thing I noticed was that the water smelled and tasted terrible – this was not the water I was used to. So we drank from the fridge or reverse osmosis system. We had dry skin but we just accepted that as the price to pay for living in a warm climate – how totally wrong we were! We, like everybody else, just went with the flow of what everybody else was doing. 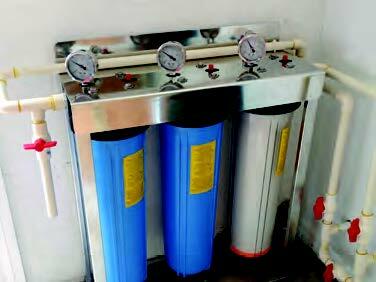 The common practice was to use a water softener and if you wanted good drinking water you needed reverse osmosis. So we did all of that, and still the water tasted bad from the tap, we still had dry skin, and we never liked the water from the reverse osmosis system. Ugghhh. Then in the late 1990’s, bottled water was getting really popular. Because our water was so bad, that sounded like the way to go. So we got trays and trays of bottled water. Some tasted good, some not. If the bottles were in a hot car or delivery van or sat in the sun, the water gets too old and it gets a “plastic” taste. Chemicals are leaching from plastics into the water. BPA, or bisphenol A, is often found in disposable water bottles and babies’ milk bottles and cups. BPA is being phased out of plastic packaging due to fears it may disrupt our hormones – but a replacement for it may be just as harmful –ouch! I have been on a personal quest for the last ten years to solve my water issues in an affordable manner, taking advantage of my engineering and chemistry background. I never felt like spending $5,000 or more for water treatment systems offered by the big companies Kinetico and Culligan. After trying multiple systems at my house over the years, I finally figured it all out. I love my water now. We drink it from any faucet. The water tastes great – no more chlorine taste, no “plastic” chemicals, love my showers, the water feels great and our skin feels soft. This is what water should be! Everyone should have this quality of water, and it is really affordable, less than $1 per day for great quality water from every faucet! This is a system everybody needs! Hence, this motivated me to start my own company: Smarter Water Solutions LLC. We provide (smarter) affordable whole house filtration systems as well as customized well water treatment. We listen to our customers and customize to their needs and wishes. We take pride in our work and achieving 100% customer satisfaction. Give us a call at 813-929-8149 for a free estimate or check us out at www.smarterwatersolutions.com. Water is the gift of life – enjoy it!